Broken Bootlegs is a weekly series covering unlicensed games (also known as bootleg games) for mainly 8-bit and 16-bit consoles. This week’s edition covers something that could have really interesting: a Command and Conquer beta for the Sega Genesis! I’ve played a few RTS games over the years, and love the heck out of em. Myth 2, and the Age of Empires series immediately comes to mind, but there’s one series that I have yet to play: Command and Conquer. While this beta is in a very incomplete state, it can give players a small look of how the original game plays. 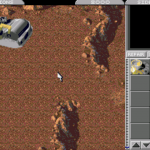 Developed with the Tomsoft MegaDrive SDK, Command and Conquer was an attempt to backport the original DOS game to the Genesis. The reasons why development stopped are currently unknown, and is probably lost to time. Upon starting up the game, there was a basic title screen to look at, and not much else. From the start screen was a small introduction graphic, and then gameplay started. One thing I immediately noticed was that there was no sound whatsoever. No music, no sound effects, nothing. Already off to a great start, I started constructing some base facilities in my starting area. The controls are fairly easy to work with: move the cursor to select a unit, buy it, and then place it. While easy, manurvering the cursor is pretty smooth. Unfortunately, the game will lag when the screen is saturated with objects. Moving around the map with the cursor is slow as well. One other major thing I noticed is that units can be produced, and can be ordered to move or attack. While both are good things to have, there’s no enemy to attack! Unit AI seems a bit rudimentary, albeit somewhat complete. While there’s a little bit of a map that can be explored, there isn’t too much to the map itself. Graphically, this game is really washed out due to the Genesis/MegaDrive graphical capabilities. Conversely, units and facilities are animated! After issuing the command to construct base facilities, I could see them popping up with neat little animations. In addition to that, watching units move around is a nice touch. The Command and Conquer beta is a curious entry, and is worth a play at least to see something interesting. Sadly, this game has not been made available in cartridge format from what it looks like. If it has been, it make an interesting piece for any bootleg collection. In any case, I’m going try to track down a copy of C&C for the PC or PlayStation to play.